Stelios Demetriou is a Partner at EY and the Transactions Advisory Services Leader in Cyprus. Stelios has more than 18 years of professional experience and he was involved in a number of banking projects, asset disposals (including distressed) and corporate restructuring exercises, acting both on behalf of the Banks and Corporates. He helped to raise equity and finance for companies and individual projects, handled merger and acquisition transactions, performed business valuations, prepared business plans and feasibility studies. Stelios managed strategic opportunities and was involved in a number of IPOs. He led management buyouts (MBOs), provided strategic advice to clients, and identified and secured new deals. Finally, he structured and negotiated the detailed terms of several deals and managed buy and sell side due diligence projects. 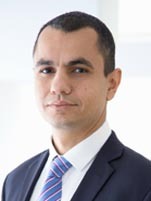 Stelios holds a BSc in Economics and Finance from the University of Birmingham and the Corporate Finance Qualification from ICAEW, Securities and Investments Institute UK and the Canadian Institute of Chartered Accountants. He is also a qualified Chartered Accountant from the ICAEW (UK).